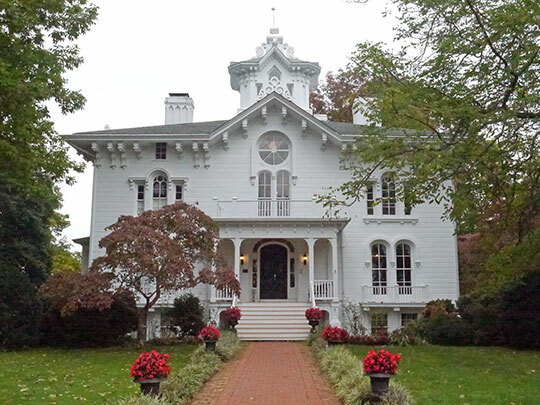 Photo: Mayhurst, 12460 Mayhurst Lane, Orange, VA. Mayhurst was completed in 1860 by Colonel John Willis, a great-nephew of President James Madison. Listed on the National Register of Historic Places in 1969. Photographed by User:Rutke421 (own work), 2008, [cc-by-1.0 (creativecommons.org/publicdomain/zero/1.0/deed.en)], via Wikimedia Commons, accessed November, 2013. Orange County administrative offices are located at 112 West Main Street, Orange VA 22960; phone: 340-672-3313. Orange County was formed in 1734 from Spotsylvania County and was named for William IV, Prince of Orange. He had married Anne, the Princess Royal, daughter of George II, of England, the same year. The first session of the county court was held on January 21, 1735, in a house belonging to Colonel Henry Willis on Black Walnut Creek in the eastern part of the county. In 1749 Culpeper County was formed from part of Orange. Virginia Historic Landmarks Commission, Staff, Orange County Courthouse, nomination document, 1979, National Park Service, National Register of Historic Places, Washington, D.C.